I’ve always done silly voices! I would guess it was probably quite annoying for everyone as I was growing up and I’m sure no one ever thought that particular skill would ever be needed or even useful. It's funny how now, years later, I find myself actually using this particular skill in Music Audio Stories and I've ended up recording many of our characters' voices! 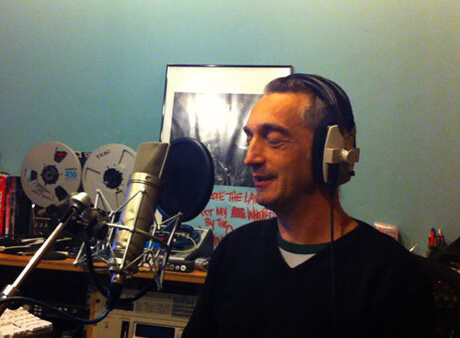 The hardest voice to record was Sid in March of The Ants. I pitched the voice rather high and it became increasingly difficult to maintain it throughout the story, I haven't made this mistake again! I probably enjoyed recording the voices of 'Yes' and 'No' in The Big Apple the most as Belle and myself improvised a lot of the end section as we were recording it. My favourite character to record was Captain Russell in our audiobook Johnny No Cash. He was played by my friend Paul Kaye, I know he’s a professional actor but he just brought so much life to the lines. It was a joy to watch him work. I’m not sure which is my favourite story, I love them all but if you really pushed me I guess it would be our latest story Billy Joins the Circus. In writing, recording and mixing our Music Audio Stories I get to use pretty much all of my skill set. I particularly enjoy creating sounds for the stories like in March of the Ants using a popular cheese based snack on the grill of my computer to make the sound of the rock being rolled away, or in Robert and Johnson’s Space Adventure using and old tape echo machine and my guitar to make the sounds of space. All in all I think I would have to say making these stories isn’t like work, it’s too much fun! Hopefully, that comes across in the recordings and you enjoy listening to them as much Anna-Christina and I enjoy making them.